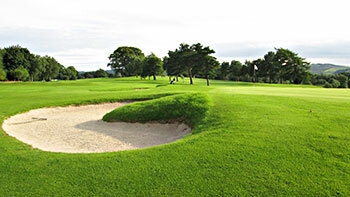 When Lochmaben Golf Club was established in 1926, the club committee had the good sense to call in a reputable architect and so James Braid was engaged to lay out a course for the members. Within a short space of time, Braid had pegged out nine fairways around one side of a small loch, and in no time at all, local golfers were indulging in their new sporting pursuit. Nowadays, the course extends to slightly less than 6,000 yards from the back tees, with only two par fives on the card at the 11th and 15th. One of the newer holes, the 120-yard 8th, is now regarded as the signature hole, requiring the tee shot at this short par three to be played over a loch inlet towards a green benched into the hillside overlooking the water. I was a little surprised to see Lochmaben make it into the latest edition of the Dumfries & Galloway regional chart so I thought a little bit of quality control might be in order when paying a recent visit to this course. Having played in the morning at Kirkcudbright, an unranked contender that I really liked, I had high expectations of the golfing feel good factor continuing through to close of play for the day here – unfortunately, those hopes were not to be realised. There’s nothing wrong in terms of its appearance, because it’s a very well-manicured layout - it’s just that I hadn’t expected Lochmaben to be such a modern track (and I know the second nine was only installed twenty years ago) with a slightly manufactured, even corporate, feel to it. It starts off on the wrong foot, mind you, with two horrendous back-to-back short holes at the 2nd and 3rd, holes which are meant to link the old James Braid holes at the 1st and 4th. I’d love to know how many members mark a pair of threes on their cards here on a regular basis as the crowned greens on both long par threes are way too difficult to hit and hold, especially the two-tiered version at the uphill 2nd. For me, the only hole of real interest on the front nine was the lovely 8th beside Kirk Loch; short; requiring an all-carry tee shot across water to a well bunkered green, it’s a bonny wee par three. On the back nine, holes 10 to 14 form a rather uninspiring loop away from the loch (with a very awkward walk backwards and downhill from the 13th green to the 14th tee) though, on the positive side, work at the new offset 15th green and new raised tee boxes at the 16th looks like it will really improve both holes. I was so disappointed to see old Braid fairway bunkers on holes 4, 6 and 17 grassed over and that act of golfing vandalism really summed this place up for me – soulless, without the slightest appreciation for its golfing heritage. Sorry, I imagine that Lochmaben’s above average conditioning will override any architectural misgivings for many golfers but the course just didn’t cut it for me.